Lexmark’s Supply Chain Document Optimization solution simplifies even the most complex document processes. Whether your goal is to maximize productivity, increase visibility or eliminate costly supplies, Supply Chain Document Optimization reduces manual, paper-based tasks that are disruptive to logistics operations. 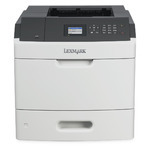 The Lexmark MS711dn prints on a variety of sizes and materials from small, narrow formats to vinyl outdoor media. For businesses looking to boost process efficiency and minimize errors, Supply Chain Document Optimization delivers powerful features that streamline each step of retail shipping and receiving. Print forms on demand based on specified criteria, eliminating the expense and delays associated with preprinted forms. You can easily generate content including packing lists, shipping labels, banners, continuous feed media, vinyl labels, cardstock and paper labels thanks to Lexmark’s advanced media handling capabilities. Speed user adoption across your supply chain with a familiar touchscreen interface and easy-to-use app for mobile devices. Supply Chain Document Optimization integrates seamlessly with existing ERP, ECM, document management and back-end systems. Capture shipping and receiving documents in real time, and store data in existing systems for immediate retrieval across your organization. Plus capture in stores, regional op centers, warehouses and more. Customize and collect key metadata to sort and route documents based on data gathered, document type or extracted info. Easy to use, simple to integrate and customizable. That’s a smart solution. Lexmark’s RFID Laser Printing solution programs and prints RFID tags simultaneously to eliminate manual scanning delays and speed shipping. Even complex media that need RFID tags are handled on one device eliminating mis-match errors and the costs associated with maintaining multiple devices. Plus, the color printing and large format capabilities, can help you increase the visibility and effectiveness of your RFID labels and processes. No matter where you have RFID implemented, from pallet labels to a yard management system, Lexmark’s color laser printers and MFPs with RFID programming capabilities can help you maximize your effectiveness. Columbia Sportswear used Lexmark to reduce their output costs and drive efficiency across their headquarters, stores and warehouses.